Stephen King’s novels have provided the basis for some of the most enduring horror cinema, from Carrie and Christine to The Shining and The Stand. 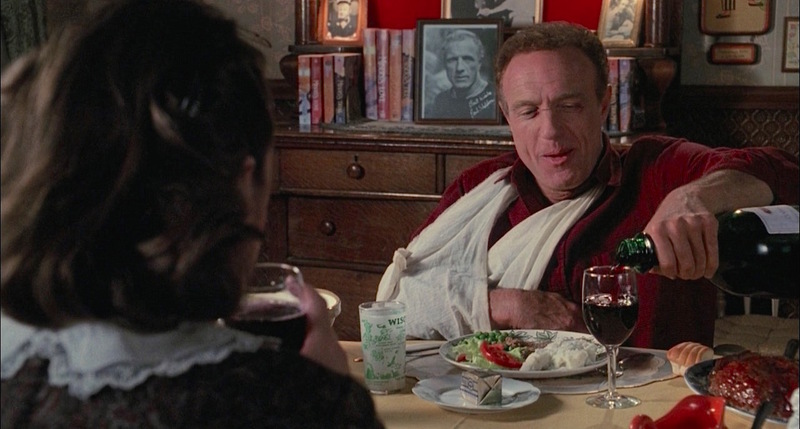 With Halloween a week away, I wanted to focus on a request I received to take a look at the protagonist’s style in the thrilling and witty adaptation of King’s self-inspired 1987 novel Misery. The novel was partly inspired by King feeling trapped both by his demanding, horror-loving fans and his own drug and alcohol demons, all embodied in the form of the obsessive tormentor Annie Wilkes. 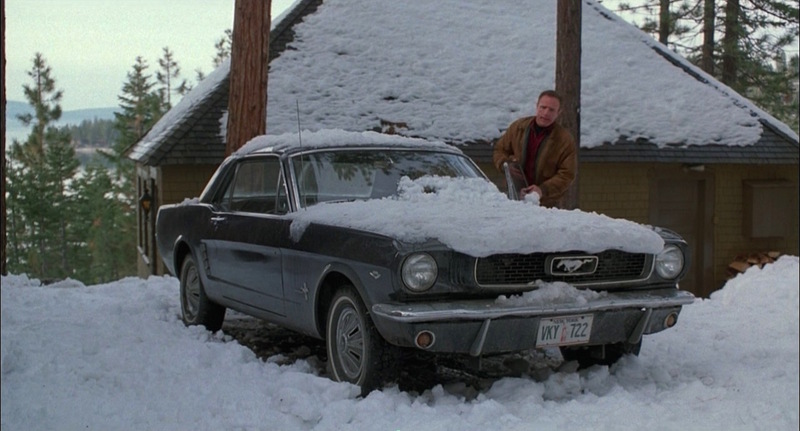 Unfortunately, the New Yorker’s beautiful rear-wheel-drive pony car can’t handle the rigors of Colorado’s winding snow-covered roads and Paul soon finds himself bloodied, dazed, and trapped in his crashed Mustang… until a mysterious figure lifts him out of what would be a certain death scenario. 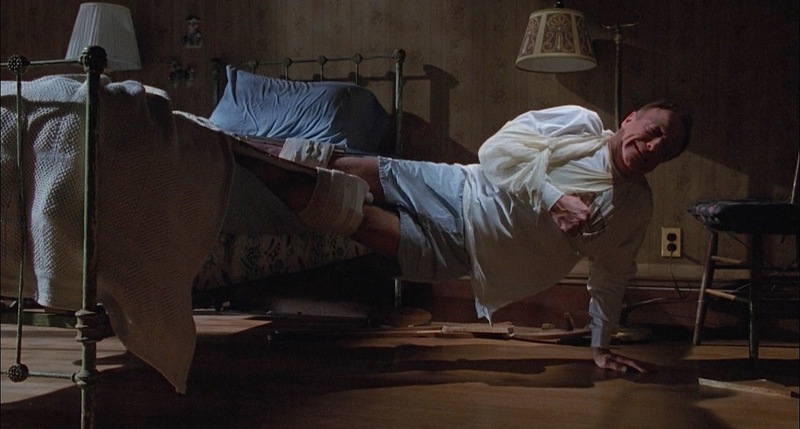 Paul awakens to the beaming face of Annie Wilkes (Kathy Bates in an Oscar-winning role), his “number one fan” who reveals herself to be his number one nightmare. Paul’s jacket for the Colorado winter is a tobacco brown suede blouson with a hunter green quilted lining for extra warmth in the snowy climate. The jacket has large bellows pockets on the hips that close with concealed-snap flaps, and there is a vertical opening behind each pocket for an additional hand pocket on each side. The zip-up jacket also has a two-button standing collar that Paul wears open and folded down like a standard shirt collar and ribbed knit cuffs and hem. 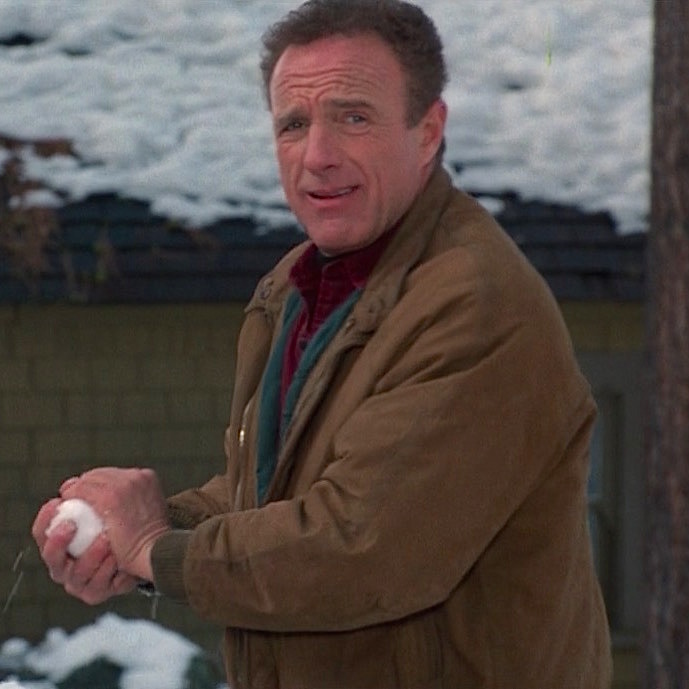 One last snowball before hitting the road… and hitting the snow. 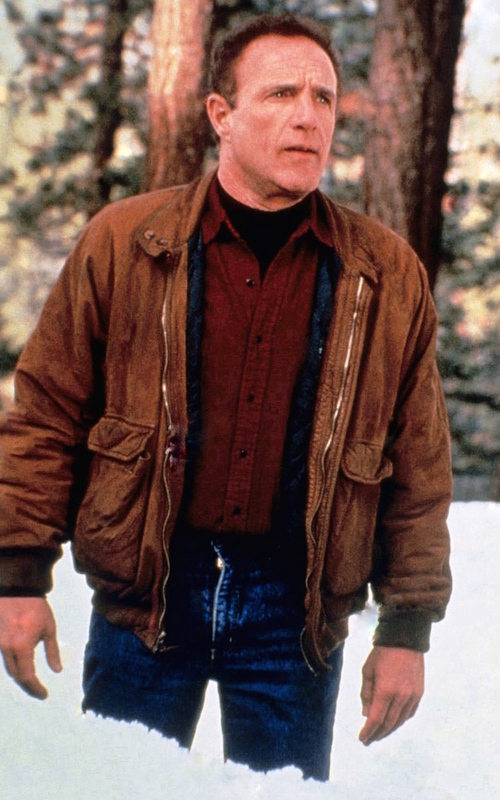 Paul wears multiple layers under his jacket, including a dark red shirt made from a heavy microfiber fabric, patterned with a grid made of a black mini-check. The shirt has a front placket with black plastic sew-through buttons, two button-through patch pockets on the chest, and button cuffs. 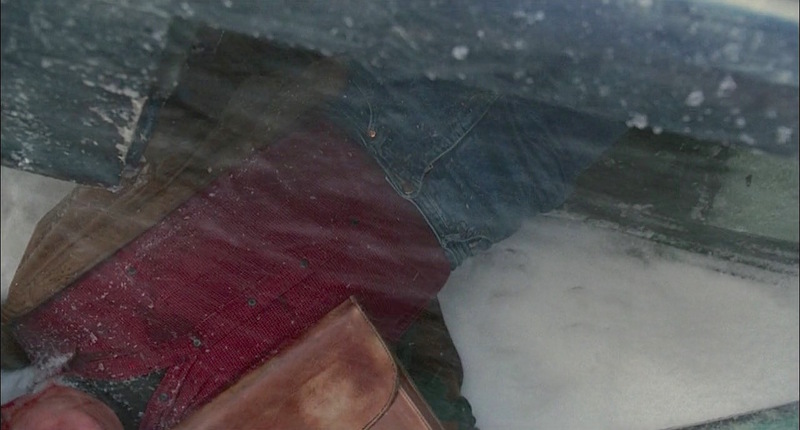 Annie ostensibly removes Paul’s shirt along with the rest of his clothing after his accident. She gives it back to him to wear, perhaps as a reward, when they dine together at his suggestion midway through his draft of Misery’s Return. Under the red shirt, Paul wears a black ribbed knit turtleneck. Before he is confined solely to sweatpants, Paul wears a pair of medium blue denim jeans with a zip fly, worn without a belt. 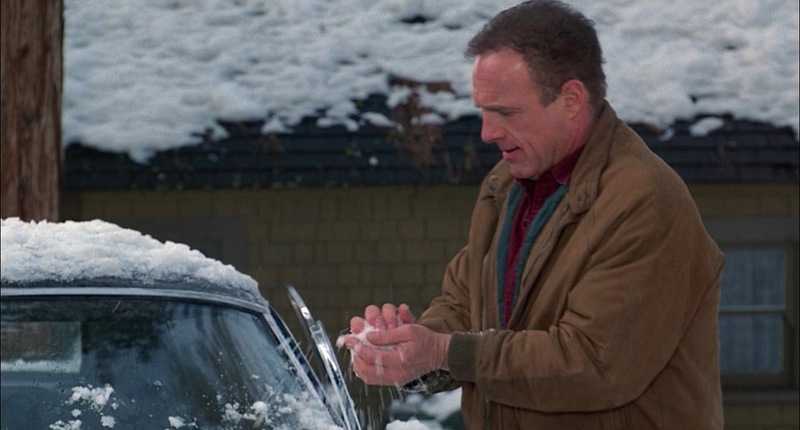 Paul is pulled from his Mustang by a less-than-benevolent savior. Paul wears a pair of russet brown moc-toe work boots with two-tone rawhide laces through seven derby-style eyelets up the front of each boot. 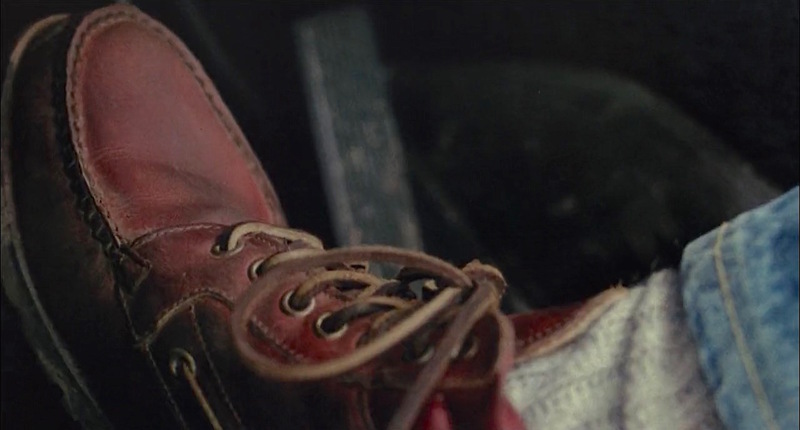 The boots also have two sets of grommets for decorative side lacing, similar to the classic Sperry Top-Sider boat shoe. Brooks Brothers, Ralph Lauren, and other companies that mastered preppy fashions have offered this type of “boat boot”, so named for their similarity to the traditional New England loafer. He wears a pair of heavy ivory ribbed-knit wool socks to keep his feet warm when trudging through the snow. 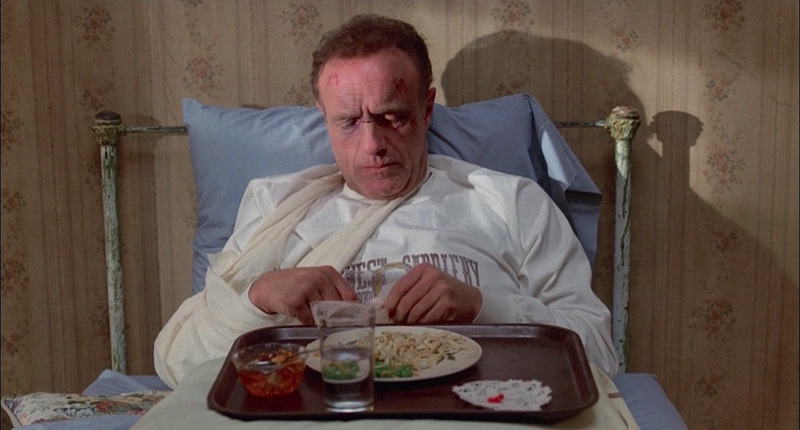 When Paul wakes up bedridden at Annie’s, his wardrobe is reduced to a white long-sleeve T-shirt, slightly torn. This may be the shirt that Paul had been wearing as a undershirt beneath his turtleneck, but the emblazoned logo for “OLD WEST SADDLERY Leather Goods | Outfitters” may suggest that it came from the shop of the same name in Cortez, Colorado. Not yet provided sweatpants by Annie, Paul spends his first few nights wearing only the light blue cotton boxer shorts he likely had on under his jeans during the accident. Escape attempt #1 of many. After his first few nights and the revelation of Annie’s true motives, Paul begins cycling through different clothing that Annie presumably provides for him. A montage set to Tchaikovsky’s Piano Concerto No. 1 as interpreted by Liberace (who else?) showcases the progression of Paul’s wardrobe in captivity as he graduates from ratty henley shirts and sweatpants to the nicer flannel shirts in blue, white, and teal plaid as well as the Christmassy red, green, and white plaid shirt that he is wearing for the horrifying hobbling scene. 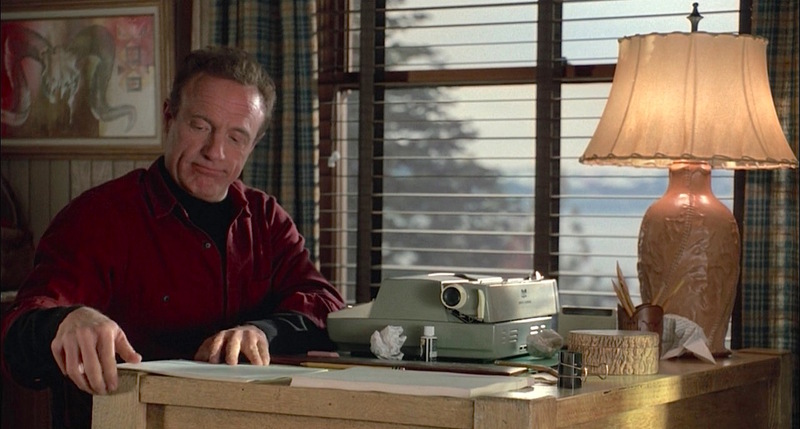 Paul Sheldon’s habit upon completion of his books is evidently well known in the literary world… or at least among die-hard fans like Annie Wilkes. 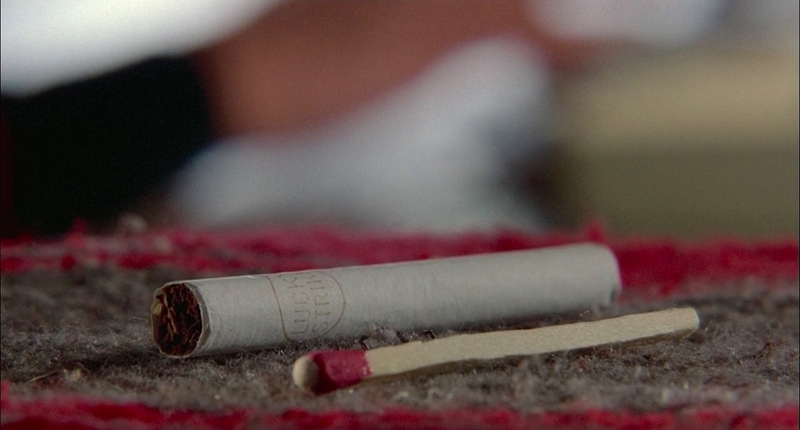 His cigarette of choice is an unfiltered Lucky Strike, as seen in the opening shot of the film. 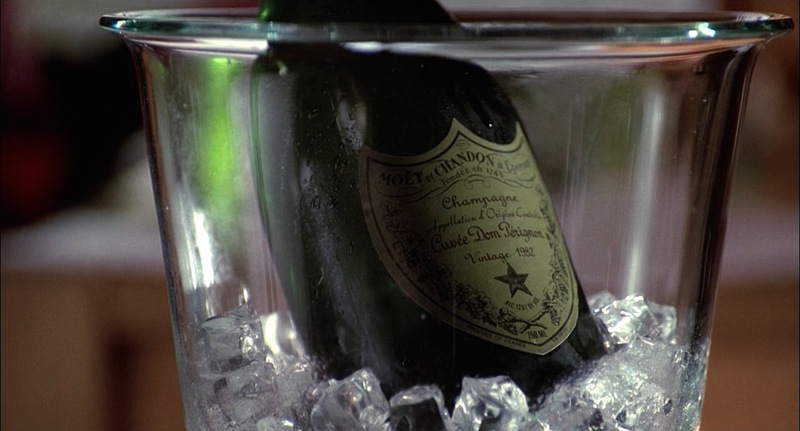 Also setting the scene in Paul’s hotel room as he finishes his novel in the opening scene is a chilling bottle of Dom Pérignon (“Dom Per-ig-non it is,” he later confirms to Annie) with a 1982 vintage. On the opposite end of the vino spectrum is the Gallo “Classic Burgundy” red table wine that Annie serves for their Liberace-scored dinner date of Spam-infused meatloaf. While not Paul’s preferred libation, he is nonetheless grateful to have the wine as a possible vessel for the codeine pills to drug Annie. The newspapers describing Paul’s predicament incorrectly describe his car as a blue 1965 Mustang. In addition to the three horizontal sweeps on the side scoops, the 1966 Mustang appears to have a free-floating “horse and corral” emblem on the grille as opposed to the honeycomb effect created by the four vertical grille bars of the 1965 models. The “289” badging and shots of the car’s interior help us determine that Paul Sheldon is driving a Mustang equipped with a 289 cubic inch “Windsor” V8 engine and Ford’s new C-4 “Cruise-O-Matic” three-speed automatic transmission. The 289 was offered in three different performance packages for 1966, a two-barrel, a four-barrel, and a High Performance four-barrel (only available with the four-speed manual transmission), but we can assume that Paul is driving the base two-barrel V8. 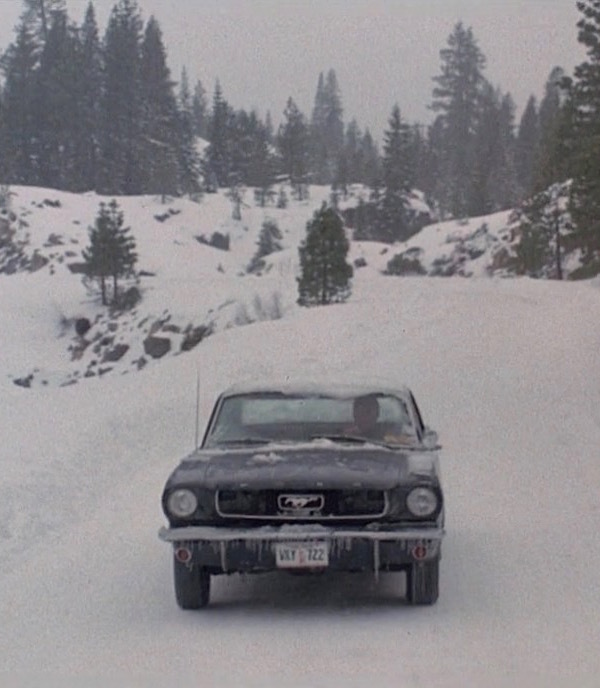 Unfortunately, the rear-wheel-drive drivetrain doesn’t do Paul any favors while driving on the snow, and his Mustang skids out of control. If only Harry Ferguson Research had carried through on its prototype of an all-wheel-drive Mustang, having purchased and converted three Mustangs to 4×4 in the hopes of selling clients on its AWD system. Paul Sheldon’s layered look nicely balances the aesthetic of a rugged outdoorsman with preppy success and would be equally fashionable and functional for autumn, winter, or even early spring. Check out the movie and read Stephen King’s novel. October 25, 2018 - 9:28 pm J.W. In my opinion, one of Kings best novels. 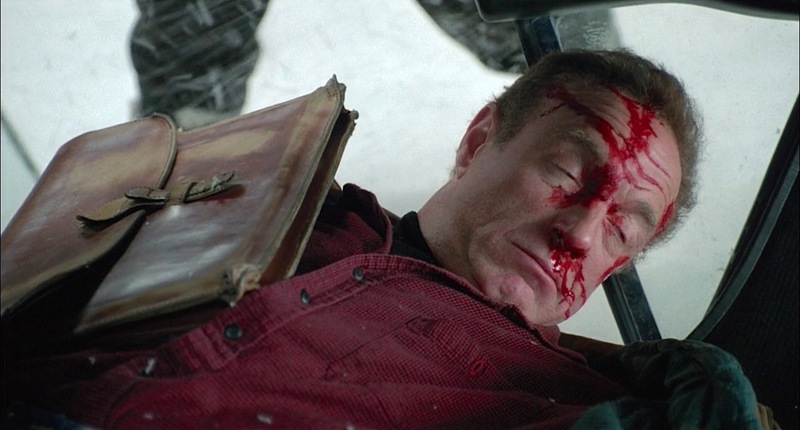 I wonder if you’ll ever do Thief by Michael Mann, another one of James Cann’s best performances (and a very underrated movie).